One of my favorite treats while growing up was dessert breads. Throughout my entire childhood, my mom worked at a bank that was next to a famous bakery, and once a week, she would bring home a baked good of her choice. I remember eating way more than my share when it was a sweet bread with crunchy toppings. 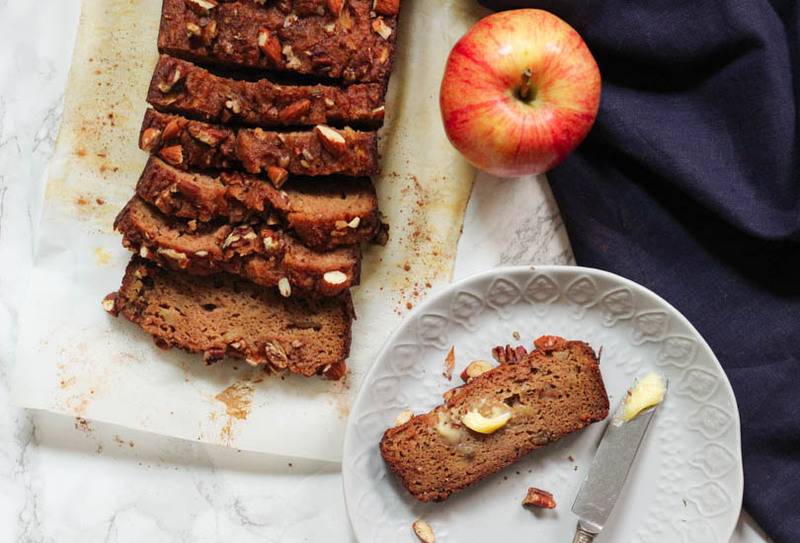 Ever since cutting out gluten and most grains from my diet because of food sensitivities, I’ve been making healthier versions of my old favorites in my kitchen, and this Paleo Apple Cinnamon Bread is one of those recipes. 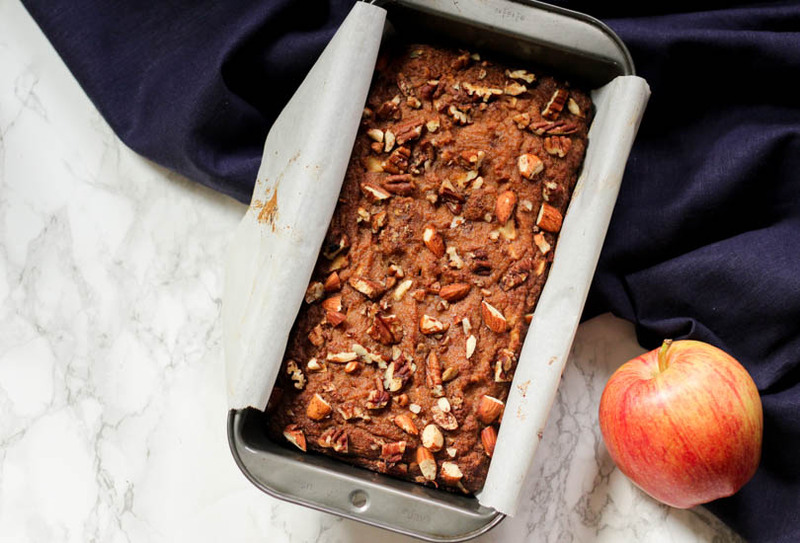 It’s so easy to make because you can combine the batter in the blender, and the result of the bread is so moist and flavorful with a strong apple flavor combined with the nutty topping. I’ve been enjoying a slice of it toasted with a slab of butter in the morning, with a cup of coffee to wash it all down. It’s the best combination, and I highly recommend you try the same! Applesauce – I highly recommend using organic and definitely unsweetened. Applesauce not only gives this recipe the apple flavor, it helps keep the bread moist and delicious. Eggs – Leave the eggs out on the counter for 30 minutes so they reach room temperature before you start making the batter. This helps the eggs to mix more evenly into the batter so you have a better texture for the bread, and it won’t harden the melted coconut oil when you mix the batter. An egg substitute will not work in this recipe, as the coconut flour requires real eggs as a binder. 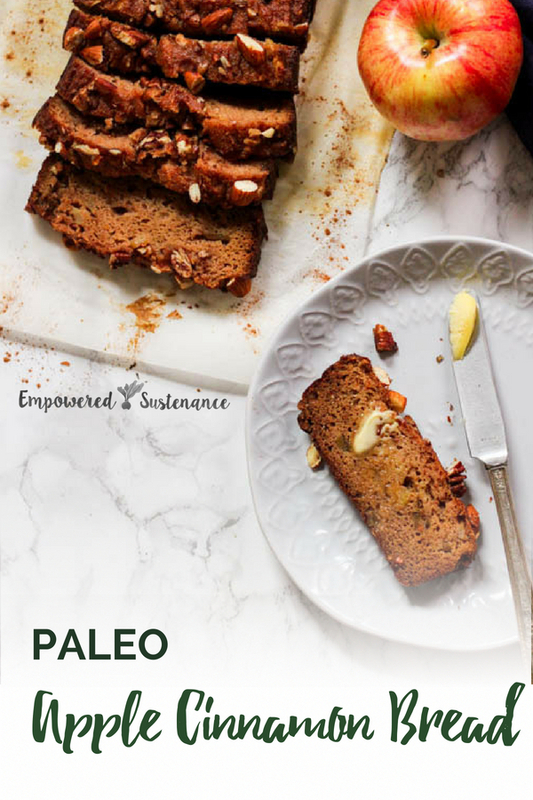 Arrowroot starch – You can also substitute with tapioca starch for this recipe, as it has the same baking properties. Preheat oven to 350 degrees F. Line a 10 x 41⁄2-inch loaf pan with parchment paper so the ends hang over the sides. Use a bit of coconut oil to grease the sides that the parchment paper doesn't cover. Combine applesauce, eggs, coconut oil, maple syrup, and vanilla extract in a blender and pulse a few times to combine. Scrape down the side and blend for 30 seconds until smooth. Add coconut flour, arrowroot starch, baking soda, cinnamon, nutmeg, sea salt, and blend again for 30 seconds. Stir in chopped apple with the batter. Transfer the batter to the loaf pan, smoothing it out into an even layer with a spatula. Combine the ingredients for the crunchy topping in a small bowl and stir together to coat. Distribute the topping evenly over the top of the batter. Bake for 45-50 minutes, until the toothpick inserted in the center comes out clean. Let cool for 30 minutes before removing it from the pan by lifting it up using the parchment paper. Slice and serve warm, or store in the refrigerator in an airtight container for up to a week. This sounds great and i have all the ingredients except arrowroot. 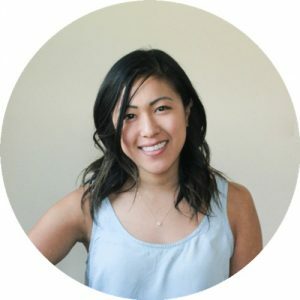 We are living outside the US, healthy ingredients are a challenge. I don’t think I can get tapioca either. Can I leave it out or is there any other possible substitute? Thank you for so many wonderful recipes. So creative! I haven’t tried with any other starches but potato starch might work. Let me know if it works for you if you try it out! How can we print this recipe? There is a Print button in the picture above. I had to hunt for it too. Is it possible to cook and mash an apple as a sauce? Can you leave out the syrup? I’ve never tried but it might work. You can also look up how to make applesauce using fresh apples. It’s super easy in the slow cooker. If you leave out maple syrup, you can substitute it with the same amount of applesauce. No good, it’s super salty and we can taste the baking soda so strongly. Such a disappointment. So sorry it didn’t turn out well! Did you make the batter in the blender and use room temperature eggs? Sometimes that can happen if the ingredients for the batter aren’t evenly distributed.